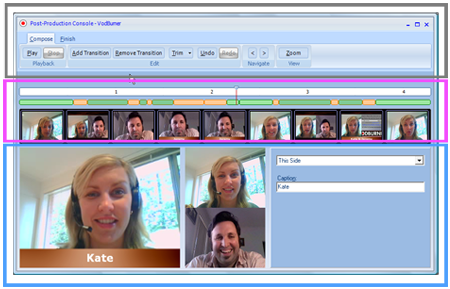 How to add captions to a recorded Skype video - Record Skype Video Calls Free with VodBurner! NOTE: This article describes basic VodBurner captions. For more advanced text options, use the “Enhance” tab (available in 1.0.2.55 and later). You can add sub-titles to your videos to make them look more professional. You may want to add a sub-title to your video to introduce the name of the person who is currently talking, and you may want to add a sub-title to show the name of the other person talking etc. In VodBurner, we call this feature “Captions”. 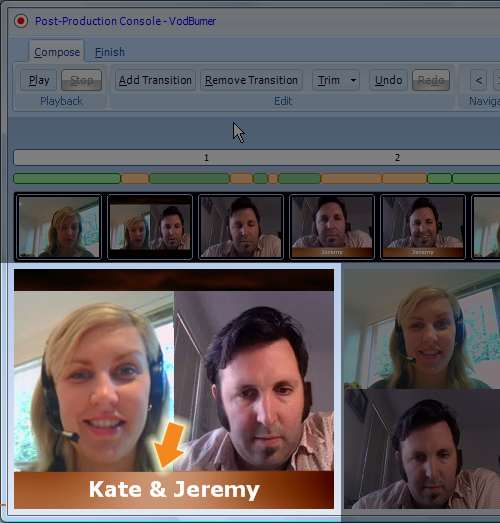 Here is how you add Captions to your videos using VodBurner’s Post-Production Console. Captions are controlled in the right-hand side of the Playback Control (indicated by the blue rectangle). Note that the ‘Kate & Jeremy’ caption has appeared. 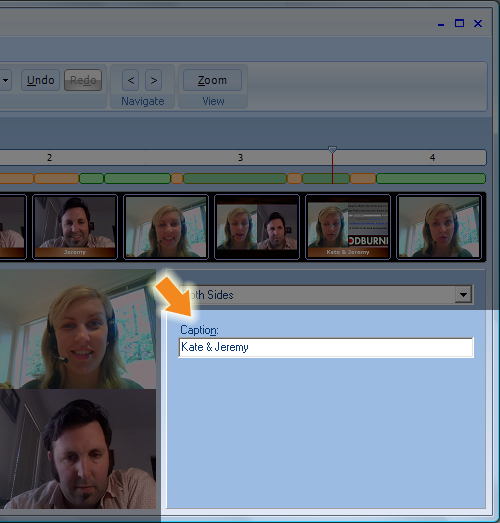 Captions appear in the segment that you have selected in the segment control, and in all segments after in the time-line. In this fashion, the caption will appear from the segment you first add it to, until the end of the video. You can change the caption in subsequent segments by typing in different text. This will change the caption in the selected segment and all subsequent segments. If you only the caption to appear in a single segment, simply delete the caption text in the following segment and that caption will be removed in the subsequent segments. Do you have any questions about VodBurner’s Captioning? Contact us.